Could a tire that repairs itself when punctured be on the way to tire shops? The American Chemical Society (ACS) says it’s a possibility now that a group of researchers has modified tire-grade rubber to fix itself. 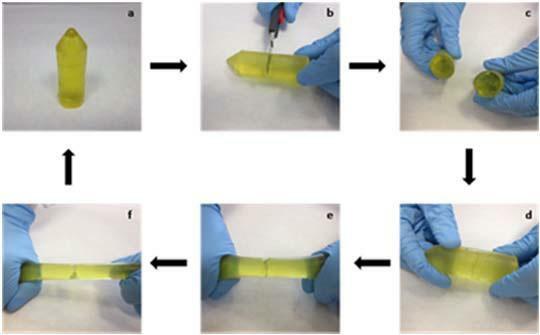 In a press release issued by ACS, the researchers say that by using a new simple process that avoids vulcanization altogether, they have chemically modified commercial rubber into a durable, elastic material that can fix itself over time. For the first time, the researchers have made tire-grade rubber without the processing step — vulcanization — that has been essential to inflatable tires since their invention. The resulting material heals itself and could potentially withstand the long-term pressures of driving. Their report appears in the journal ACS Applied Materials & Interfaces. According to ACS, testing showed that a cut in the material healed at room temperature, a property that could allow a tire to mend itself while parked. After eight days, the rubber could withstand a stress of 754 pounds per square inch. Heating it to 212 degrees Fahrenheit for the first 10 minutes accelerated the repair process. The researchers say their product could be further strengthened by adding reinforcing agents such as silica or carbon black.